1. Once you find a book, examine it before checking it out. Although there will likely be some minor wear and tear, skim through it and look for torn or missing pages, large stains, pen or pencil writing, doodles, etc. Also check the covers for missing or defaced parts. If you find any ot these, report it to the librarian, so he won´t assume that you are responsible for the damage. 2. If you are carrying a bottle in your school backpack make sure you remove it or put the books in a waterproof bag before putting it inside the bag. 3. As soon as you have brought it home, put the book neatly on a sturdy shelf or table. Do not put it indescriminately on a sofa, chair, or bed, as someone may accidenally sit on it and damage the cover or pages if it is left open. Also do not place the book where it might get wet, such as by the bathroom sink. 4. 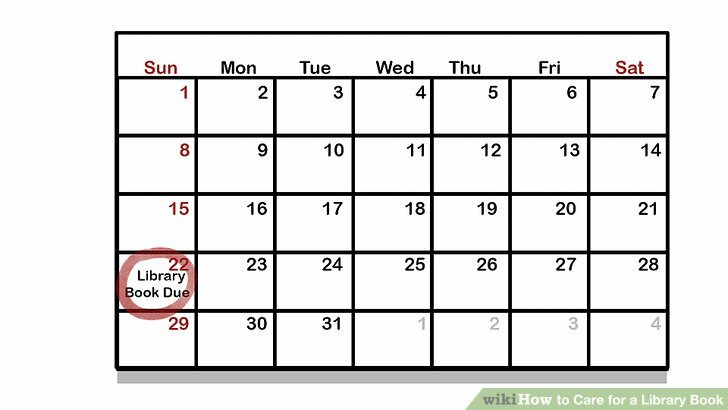 Keep a calendar. Mark the due date of the book as soon as you check it out. Know your options for renewing by Internet, you are able to do so without ever leaving home. 5. Do not write in a library book, not even in pencil. Markings are likely to be there for a long time. If you wish to mark sections for later reference, use scraps of paper as bookmarks or use removable tape flags or sticky notes (but make sure they are removed when returning). If the book includes a worksheet or questionnaire, especially in shelf-help books, to fill in, make a photocopy of that page and write on the copy. Think back to the last time you checked out a library book that had a lot of highlighting, underlining, or other excess markings, Then, be courteous to you fellow patrons. It's not pleasant to read a book that has been "personalized" by someone else. 6. If you are going to read outside, remember to take the book back inside. If it get wet or the book gets lost, you'll have to pay to replace it. 7. Use a bookmark. 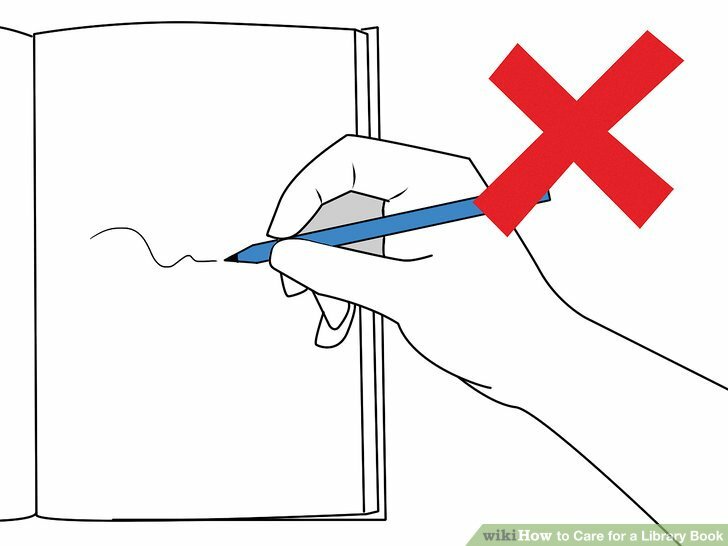 Do not dog-ear pages to keep your place, and do not use a pencil or other, larger object; it would bend the cover or pages out of shape. 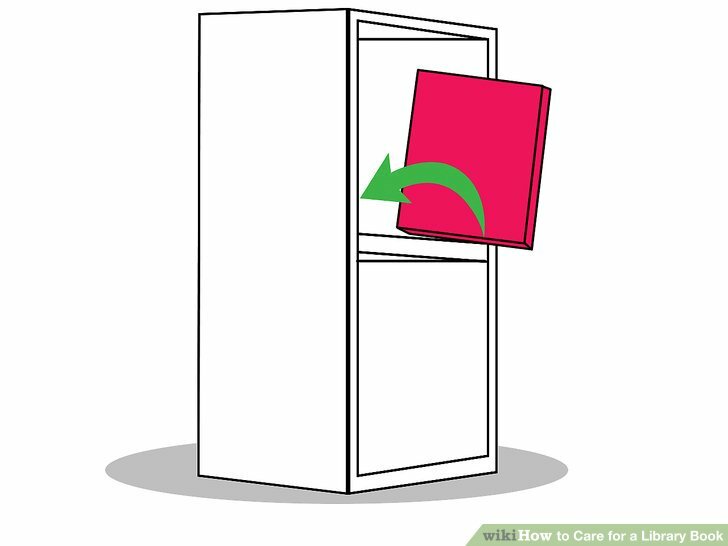 Also, avoid tenting the book open to hold your place, and don´t lay it face open, since it could get mashed open. Any scrap of paper (ticket stubs, envelopes) will serve as a bookmark, or you can make yourself a bookmark from any number of materials. 8. Keep track of the book. Keep it at home or in your book bag. If you worry about losing library books, choose particular places to put them, and put them there consistently. 9. Read and enjoy the book. 10. Return the book to the library on time. - Take the utmost care not to get the book wet. Even if it does dry out, it will develop mold, which will spread to other books. We know this will happen and will not accept wet books for this reason. Instead, you will be required to pay for a replacement fee. - If for some reason your book is misplaced, damaged, or missing you may be asked to pay a replacement fee. However, we understand that books can be read only so many times before they'll need to be retired, so enjoy the book, pay for any negligent damage that you cause, and inform me about any problems when you return the book. - Don't attempt to repair a damaged book yourself. For example, if you find a torn page, report it. Don´t tape it yourself. Libraries can repair books with better materials and methods than you can. Your are not doing your library a favor by attempting to repair a book yourself.